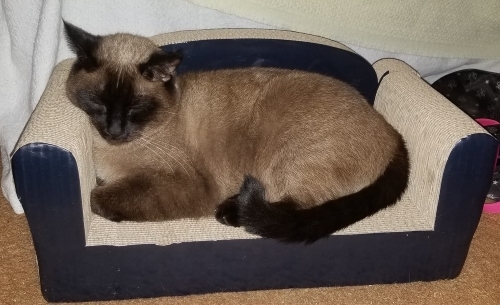 Welcome to January's Meezer Musings! January has flown past and here we are at the end of it, and it's probably a little late to wish you a happy New Year. But we are still near the beginning of the year, so it's not too late to wish you a happy 2019, and to say that I hope the year has started well for you. We'll begin this month's newsletter with a couple of stories about what happens when cats turn on their friends, a phenomenon known as redirected aggression. Back in December, Donna, one of the regular visitors to our Facebook page, dropped by in need of urgent help. Things all kicked off when Donna's three-year-old seal point, Jazzmin, got her head caught in the handle of a paper bag. Before Donna could free her, Jazzmin started racing around the house in terror. Younger 'sister' blue point Ziva chased after her, adding to the drama and fear. "When I freed Jazzmin from the bag, Ziva launched herself at Jazz, like she wanted to kill her! This has been going on for 24 hours - this, from two cats that have literally been together all their lives, sharing litter, sharing food bowls. Now they act like mortal enemies and total strangers. They cannot be in the same room without Ziva trying to kill Jazzmin (at least, this is what it looks like she is trying to do.) The screaming and howling are unbearable. What do I do? I'm at my wits end!" Shadow - scared to death? "My cats, who are usually the closest of friends, have suddenly become mortal enemies. The bigger one, the male, who is usually a bit more dominant, is cowering in a dark corner under a desk and the smaller female is sitting nearby like the sphinx. If their eyes meet, they are growling and hissing at each other. He is watching her like he is scared to death of her. My husband says they have been fighting constantly. He does say he accidentally stepped on Shadow's foot when he fed them last night and this all started after that. I cannot find anything on Shadow that indicates he is in pain. Nor on Lily. I don't know what to do. I am totally confused. Anyone have any ideas?" This behavior is known as redirected aggression. It occurs when cats get angry, fearful, or upset by something unusual happening in their environment. For example, it might happen when cats see a passing feline stranger through the window and become angry at this intrusion into their territory (this is apparently quite common), but can also be sparked by any fear-provoking trigger, such as Jazzmin's paper bag incident or the accidental treading on Shadow's foot. This provokes an angry reaction which is not necessarily aimed at the 'enemy' that sparked the anger in the first place but redirected towards another cat (or in some cases, dog or human) with whom they normally get along well. We had lots of helpful answers and suggestions, as well as more stories of similar happenings, on the Facebook page which you can read here and here but in summary, if you ever find yourself in this situation, here's what you need to do. Separate the cats! The most important thing is to make sure that no harm comes to either the cats or you, so take care that you don't get attacked in the process. Put the cats in different, private areas where they can relax safely with their food, water, bedding, litter, etc. Take your time. 24-48 hours separation is recommended by behavior experts. Give each cat lots of love and attention to help calm them down and reassure them. Calming products like Rescue Remedy (a drop or two on the ears) or pheromones like Feliway (available as sprays, plug-ins or collars) can help. Reintroduce the cats to each other gradually, just as you would when introducing a new cat into the house. Start by feeding them on either side of a closed door so that they can get used to each other's smell again, take a used towel and rub each of them with it so that their smells mingle, and then let them see each other safely. (The best way to do this may be to put one of them into a cat carrier while the other is free, and then reverse the process). Reintroduce them during the day, when they are likely to be more docile, rather than at night when they're usually more watchful and alert. Don't leave them alone together until you are absolutely sure they're friends and won't start attacking each other again. Last time I heard from Donna, her cats were still hissing at each other occasionally but calmer and settling down. I hope that both sets of cats are now back to their normal happy, friendly selves! More from Facebook - it's been a busy month! Following hot on the heels of the above and in similar vein, this question also came up on Facebook. 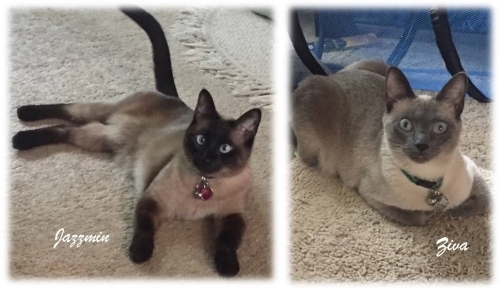 "So it’s been quite a few years of me having a Siamese but I just got an 8 month old male kitten today. When I pet him he will sometimes hiss at me. I think I remember my last one doing that but I'm not sure... is this common? Thank you!" When we're new to cats, and Siamese cats in particular, we often expect that they'll settle in quickly and love us immediately. Some cats do, in which case, so much the better, but some don't, and cats that hiss at us can be concerning. It's also quite normal. All cats will hiss a warning when they're fearful, and new additions to the family won't be at all certain of their surroundings, or you. It's very important to remember that their whole world has just been turned upside down, and it will take time for them to settle in. I've always found that leaving Siamese cats alone to do their own thing will bring them running to you quicker than anything as they don't like being ignored! And very soon you'll find that they're completely at home with you, living a happy and healthy life and probably ruling the roost! So talk to them gently, feed them, care for them, but give them lots of space and time. 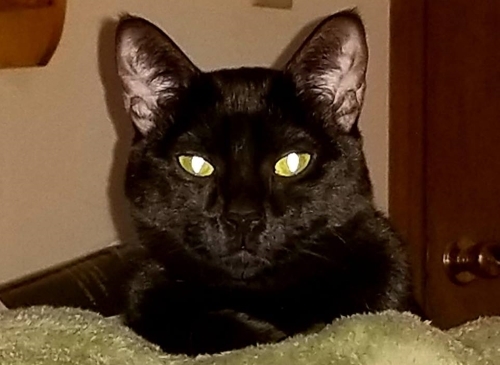 Sometimes it can take an extraordinary amount of time and every ounce of patience you have for new cats to settle in, especially when they're traumatized rescue cats, as this story from one of our readers about their rescued cats, Boo and Nibbles, shows). A happy ever after story? Recently in a Facebook group that I belong to I was delighted to come across a comment by Sylvia Court, the author of Return to Tythecott, which I read and recommended here a couple of years ago. The book (of which I now have both a Kindle and paperback copy) deserves a wide audience as it's a lovely story with the added bonus of beautiful cover artwork by Suzanne Le Good. Return to Tythecott tells the story of a very special but deeply traumatized cat who came into Sylvia's life after being rescued from a derelict barn. Sylvia named the cat Rufus. To begin with he was unresponsive and depressed, but with weeks of love and patience from Sylvia, Rufus gradually started to come out of his shell. Sylvia ... "often wondered how such a beautiful creature could have ended up in such dire circumstances. One day, however, an extraordinary thing happened. She was sitting at her computer with Rufus curled up on her lap. He began purring loudly and suddenly she felt an overwhelming urge to start typing…." We follow Rufus from his early beginnings in a happy home through a series of fortunate, and not-so-fortunate, incidents. Told in Rufus's own words, there were times when my heart was in my mouth and I was quite terrified for poor Rufus, but rest assured, the story does end well. "This is a book for cat lovers of all ages who enjoy a good adventure with a happy ending. Rufus is a cherished pet, enjoying a life of love, luxury and companionship - as all Siamese cats should. One day, however, his comfortable existence is shattered by a sequence of unexpected and devastating events, plunging him into a terrifying new world of danger and excitement…." If it sounds like your kind of book, both Kindle and paperback versions are available on Amazon, but I recommend the paperback (link below) for the lovely cover by Suzanne Le Good as well as other illustrations and photographs from Sylvia. Several of you have been in touch this month to say that you've lost much-loved family members recently - it's always heartbreaking at any time and at any age. It's especially poignant when it happens around the holidays, so heartfelt condolences, love, support, strength and comfort go out to everyone who's lost a member of either their human, or fur, family recently. That's all from Meezer Musings while we're still in January! I'll be back towards the end of next month with more musings, thoughts and questions. 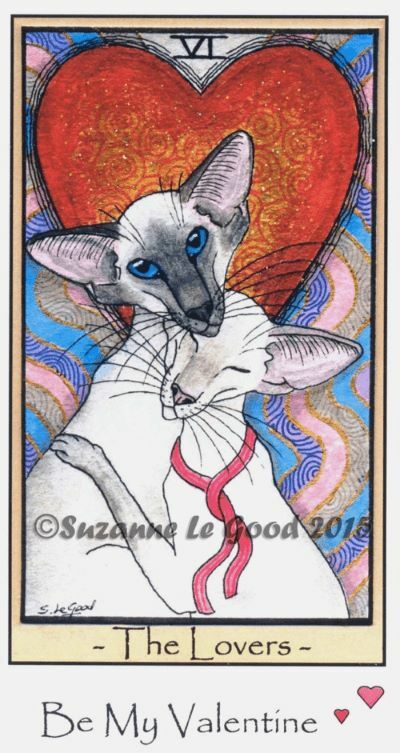 In the meantime, as Valentine's Day is coming up fast I thought you'd enjoy this Valentine card from Suzanne Le Good. It can be found in her Etsy store if you'd like to get one for the sweetie in your life. Happy February, and happy Valentine's Day, everyone!